What is the number 1 rule for creating an eco-friendly landscape? Learn to work with Mother Nature, not against her. To do that, you need to get to know your property on a deeper level. Most of the ill effects of improper gardening are from too much water or too many chemicals. Choosing plants which are compatible with your site conditions and grouping them by their maintenance needs will require less of both. Although we have access to an abundance of water most of the time in the DC metro area, water conservation is still something we should all be concerned about. An American family of four can use 400 gallons of water per day, and about 30 percent of that is devoted to outdoor uses. More than half of that outdoor water is used for watering lawns and gardens. Nationwide, landscape irrigation is estimated to account for almost one-third of all residential water use, totaling more than 7 billion gallons per day. As populations increase, demand on our water resources will grow. Conserving water can prevent or postpone the expense of building or renovating new water supply facilities. Going hand-in-hand with the topic of water conservation is water pollution. Everything that goes into the ground around your home has the potential of finding its way into local water supplies. Rain and irrigation systems wash pesticides, fertilizers and other substances into our streams, reservoirs and lakes. These pollutants can harm fish and wildlife populations, kill native vegetation, foul drinking water, and make recreational areas unsafe and unpleasant. As property owners, we each own a piece of the earth. To take care of it, and the rest of the surrounding eco-system that it connects to, we need to get to know our property. There are some things that you can learn about your site conditions from books and online resources. For others, you need to go out and spend some time in your yard. For example, you probably already know your Plant Hardiness zone. This zone number is listed on many plants and will help you buy plants that will tolerate our winters. You may also already know the average rainfall and high and low temperatures for your area. For the other aspects of your property, I suggest at least five nice slow walks around your property. Ideally, these walks should be taken at different times of the day and during different weather conditions. Why? Because you want to find out things such as where the sunny and shady spots are and where water collects after a rain. If you have a printed survey of your property, make a copy of it and use it as a diagram to make notes during your garden walks. If you do not have a printed survey, it will be helpful to draw a sketch of your property and make notes about what you learn about your landscape. When you take your walks, pay attention! Turn off your ipod. Leave your phone inside. And really notice what is going on around you. In a previous post, I suggested that you keep a garden blog or journal. A journal is the perfect place to keep track of what you discover while you are getting to know your property. If you are making a drawing, mark areas of shade and sun, slopes in the terrain, low spots that will hold water and any large trees and plants that you plan to keep. If you enjoy gardening for wildlife, I also suggest that you make note of any birds or butterflies you see in your yard and what plants or natural elements they are using. Are there any local deed restrictions or other ordinances that will affect your landscaping plans? Take digital photos of any unknown plants to your local nursery or extension service office for help with identification. Are any of your current plants native or invasive species? What kind of soil do you have? Read this article, Knowing Your Soil, to find out. Have you had the pH of your soil checked? Here is a pdf document to help you with this step: Soil Sampling for the Home Gardener. What are your goals with your landscaping? There are many benefits to proper landscaping, including aesthetics, improved resale value, noise reduction, climate control and wildlife habitat. How do you plan to use your yard? Do you need play areas for children, relaxation areas for adults, or vegetable gardens for nourishment? Do you enjoy gardening or would you rather have a yard that practically takes care of itself? 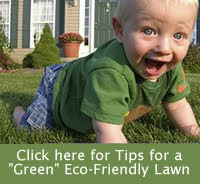 If you don't intend to do your own landscaping or lawn maintenance, read these Tips for finding an eco-friendly lawn care company. For more information on planning your landscape, visit Virginia Cooperative Extension's Creating a Waterwise Landscape. Once you have gotten to know your landscape and developed a garden plan, you are ready to move onto the next step in creating an eco-friendly landscape. : Right Plant, Right Place. Subscribe to this blog to read the next step for an eco-friendly landscape.